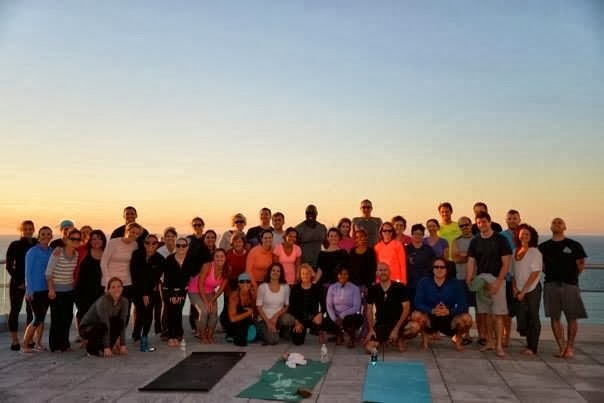 In our ever need to shake up our yoga routine, David found a class that was last Friday (taught by one of his former instructors) that was to be held on the 19th floor outdoor observation deck at the new Ernst & Young headquarters in downtown Cleveburgh. 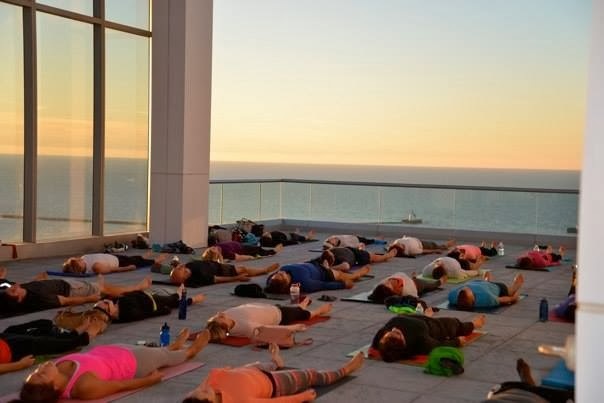 Sky Yoga, was the event's name. David tried to entice me with the wine and apps afterwards that would be served - but they were "vegan apps", so....... As it turns out the plural in "apps" was not exactly accurate. We got there a little early, but not very. We took in the sites of Lake Erie and the west side of Cleveland. Personally, I would have liked the deck to be on the other side of the building to look into downtown, but eh, no one asked me when designing the place. The best view you had looking east was of the football stadium and Burke Lakefront Airport. Since it was late September, and hour from sundown and on the 19th floor, the potential for it being cool and breezy - even with no clouds and plenty of sun - was high.......and we weren't disappointed. Yeah, there was a pretty cool lake breeze, but after you got going with the practice, it was not bad. I would have liked the practice to be more intense, but......out of the 50 or so who showed up, about a third were first timers, so we went with basic stretching and twists for the most part. For me, there was also an issue of the textured cee-ment floor, making it hard to find a truly flat surface for most things, let alone balancing poses. I could not hold one of those. Afterwards, the apps, oh sorry, app, was edamame hummus. It was actually good. The wine was fair, but trust me, I drank it. David came up with a great idea for the instructor to have a series of these at other skyscraping (it could be a word!) office buildings around town. ....just not in winter. Here are some other shots of the evening. Here was the group...or at least most of them. David and I are in the front row. the cee-ment floor was, well, dirty. These are girl's feet...and mat. My mat is more textured so it didn't show off my prints as well. the guy behind me is pretty cute. Shavasana. I'm the bald guy in black closer to that post. ...but what a view. Of the lake, not of me. Just two guys enjoying the day and each other's company. Looks like it would be a great place for yoga if it is quiet enough. I rather like looking at david...rawr. where the river meets the lake...interesting idea for yoga. That first pic looks like you're on Breaking Bad. But that last shot is great! I've always been interested in yoga but I've never pursued it. How do you find the time? !